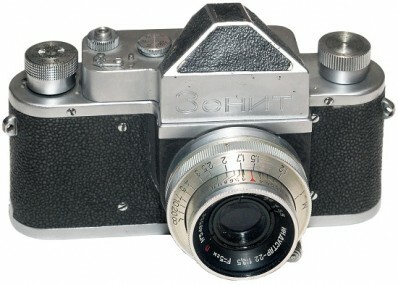 The camera is essentially a Zorki (Leica II (D) copy) with a rangefinder replaced with a reflex housing. The film loads from the bottom, as in screwmount Leicas. It has all the Zorki specifications. The camera is very compact and handles nicely. It even has a small stabilizing flip-up foot under the lensmount . 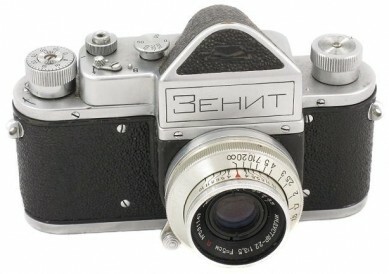 Although beeing uncommon itself, Zenit camera can be found in many variations indeed. The earliest productional versions comes with square Logo. 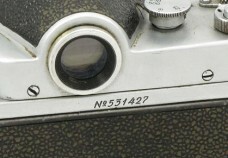 Early cameras come with serial number stamped (not engraved) on the rear plate. 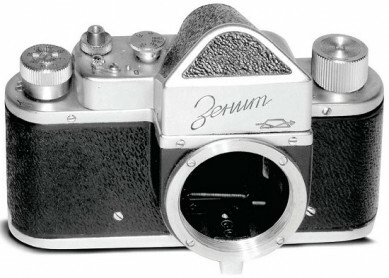 Early cameras have leather covering around the shutter housing. Some late cameras can be found without strap lugs (see camera #5513782). Camera opposite from Ilya Stolyar (USA) private collection. PM3005. The idea of including a reflex mechanism in a body originally designed as a rangefinder is more than original. With the exception of the Swiss ALPA reflex in 1942, the major players in the photo industry will wait for the end of the fifties before proposing cameras following this concept. The dimensions of the body are maintained, with the exception of the prism and the mirror chamber, of course. 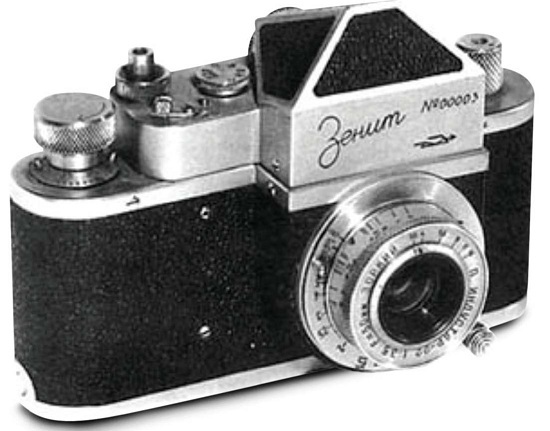 The lens on this is an Industar-22 "Zorki" shortened by the factory, from 1951 (source: "The authentic Guide to Russian and Soviet Cameras" by J.L.Princelle, 2nd edition, 2004). 6 copies released in 1950. 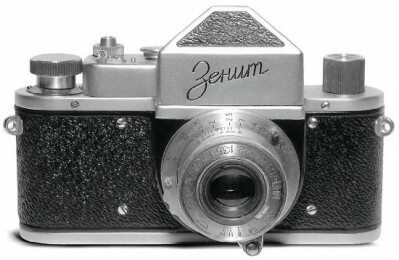 PM3005 - Zenit Prototype camera. PM3010. Another prototype of the particular camera. Serial number on the rear plate already. Bigger film rewind knob. Few copies released in 1951. Picture of Zenit Prototype opposite was kindly provided by the authors of famous SSK book "1200 Cameras from USSR". PM3010 - Zenit Prototype camera. PM3015. Another prototype of the particular camera. No more KMZ logotype on body. Strap lugs on body. Changed design of shutter advance knob. 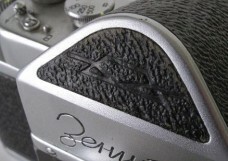 All camera's heads have line-finish style. Very few copies released in 1951. 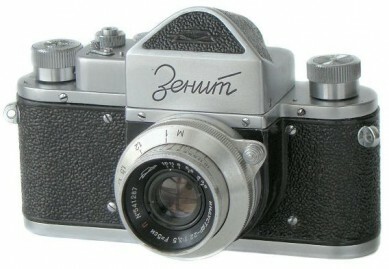 PM3015 - Zenit Prototype camera. PM3020. 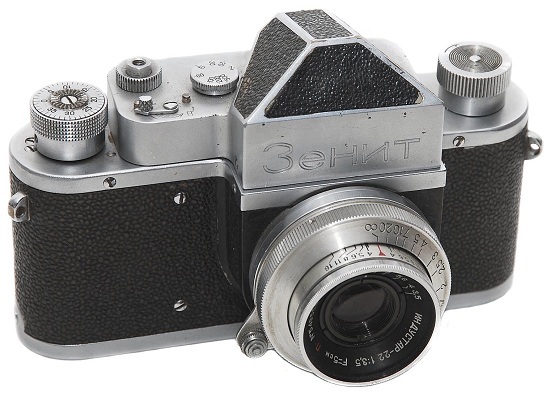 Prototype or short-run preseries version of Zenit-1 camera. Appr. 200 (?) units released in 1951-1952. Changed name markings on the front plate. Changed design of film advance knob with frame-counter on the top already. Changed design of film rewind knob. The balance foot on shutter housing already. PM3020 - Zenit Prototype camera #00010. PM3050. An earliest version of the productional "Zenit-1" camera. Few hundred cameras released in 1952-1953. 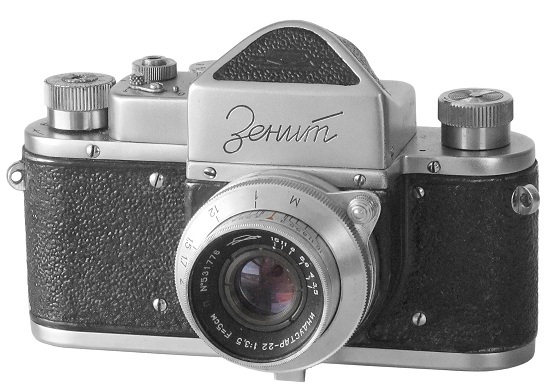 So called "Zenit Square Logo", since nameplate markings outlined by thin decorative rim (see picture opposite). Old style of serial number engravings on the rear plate. One screw on the rear plate (see picture below). Leather coverings around the shutter housing. Prominent KMZ logotype on the prism. 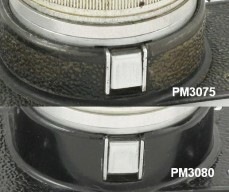 PM3065. An earliest known version with regular Zenit markings already (see picture opposite). Released in 1952-1953 only. The same old style of serial number engravings, one screw on the rear plate. Leather coverings around the shutter housing. Prominent KMZ logotype on the prism. An earliest so far known camera has s/n #520298 (private collection). Camera opposite from Ilya Stolyar (USA) coll. PM3070. Camera identical to PM3065, but with Cursive serial number already. An earliest so far known camera has #530487 (source: Alexander Shulzh). PM3075. 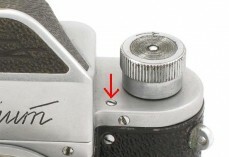 Camera identical to PM3070, but with 2 screws on the rear plate already (see picture below). Still cursive serial number engravings, leather coverings around the shutter housing. Camera opposite from Ilya Stolyar (USA) coll. PM3080. Camera identical to PM3075, but with black painted shutter housing again (see picture below). Camera opposite from Ilya Stolyar (USA) coll. PM3085. Camera identical to PM3075, but with old style of serial number engravings yet. 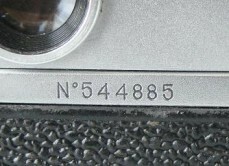 An earliest so far known camera has s/n #532085 (Molotok, 2009). PM3090. 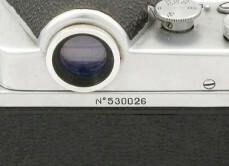 Camera identical to PM3080, but with old style serial number engravings yet (see picture below). Slightly changed form of shutter release knob. Camera opposite from Ilya Stolyar (USA) coll. PM3100. Another interesting version with vulcanite in dark grey-green and leather covering around the shutter housing. The particular camera has "Zenit" markings in bigger Cyrillic characters, though strap lugs are smaller in comparison with regular ones. Camera opposite from Ilya Stolyar (USA) coll. PM3105. Camera identical to PM3080, but the KMZ logotype is deepened on the penthaprism now (see picture below). All previous versions have prominent KMZ logotype on the prism. The particular camera is fitted with new Industar-50 3.5/50 lens. Camera opposite from Ilya Stolyar (USA) coll. PM3110. 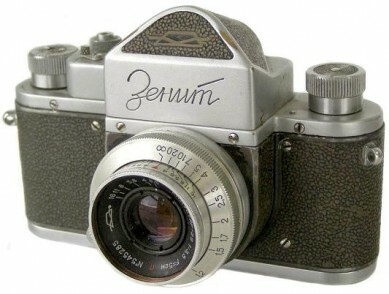 The transitional version of Zenit camera. Still 4 screws on the frontplate, but with additional screw added on the top plate, near the film rewind knob (see picture below). No otherwise different from PM3105. Camera opposite from Ilya Stolyar (USA) coll. PM3112. 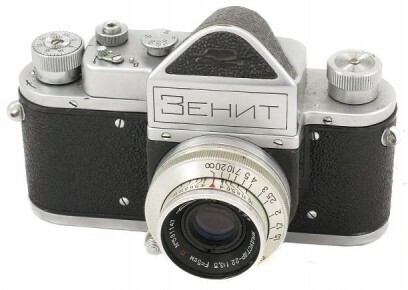 Very nice and unique version of the particular camera. KMZ logotype on the frontplate, instead of prism. 2 screws on the frontplate (see picture opposite). No otherwise different. Picture of Zenit camera opposite was kindly provided by authors of famous SSK book "1200 Cameras from USSR". PM3115. Quite common version of Zenit camera to find. 2 screws on the frontplate already (see picture opposite). Standard cursive serial number (see picture below). Fitted with Industar-22 3.5/50 or Industar-50 3.5/50 lens. No otherwise different from PM3110. Released in 1955 only. Camera opposite from Ilya Stolyar (USA) coll. PM3120. Less common to find version of the particular camera. No strap lugs on body ... No otherwise different. Camera opposite from Ilya Stolyar (USA) coll.